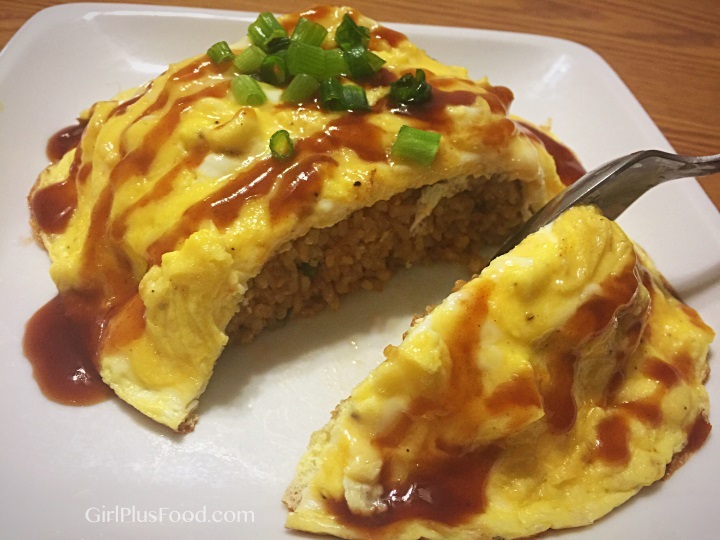 “Omurice” is a Japanese omelette rice dish. “Omu” is short for “omuretsu” (The Japa pronunciation of “omelette”) and “rice” – the sweet, pan-fried rice cooked with ketchup and chicken. 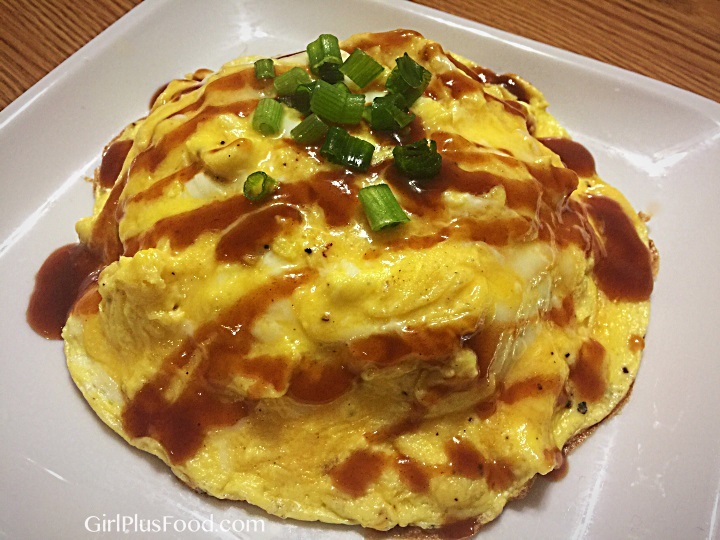 It’s a much fancier way of serving scrambled eggs drizzled with ketchup (holy yum… I love that stuff!) And the Omurice only takes about 20 minutes to cook! I’ve also served it with tonkatsu sauce and Japanese curry… to DIE FOR! Wasn’t that wild? And it’s really IS that quick and simple to make!And I want to introduce you to this next video. It’s been viewed over 7 MILLION times… 5 million of those views were quite possibly from me!!! A chef in Kyoto demonstrates his most brilliant omurice-making skill that is rivaled by NONE! He cooks his fried rice… followed by the most beautiful French omelet… slides the omelet onto the rice… and finally slices through the top of the omelet, releasing the custardy, soft-cooked eggs! 2:25 is when the magic happens. Sit tight, because it’s… beautiful. In a medium-sized bowl, beat eggs, salt, and heavy cream until well combined. Add oil to a large, nonstick pan, and add onions and garlic. Cook over medium heat until onions are soft and semi-translucent. Turn heat up to high, add chicken and continue cooking until the chicken has warmed. Add rice to pan and use a spatula to break up any clumps. Add ketchup and stir-fry until everything is combined. Season the rice with salt and pepper to taste. Use a small bowl to mold the rice and arrange on plate. Put pan back on the heat and pour egg mixture into pan. Gently stir up the egg curds with a spatula. Cover the pan with a lid and turn down the heat to medium low. The eggs are finished when they're no longer runny, but the top surface still appears wet. Slide the egg from the pan onto the rice. Drizzle ketchup, or any other sauces of your choice! Great video from Tampopo (one of my favorite of Itami Juzo’s movies and that chef in Kyoto. I like that he makes basically fried rice and then places that beautifully cooked omelete. Your recipe is also good. I like using chicken the way you do, Kind of reminds me of an Oyako Donburi. Thank you for this recipe. We love omurice! The videos were awesome, thank you for sharing them! And thank you for the recipe. I’m going to make this tonight! Hi Janelle! How did it turn out? I hope you loved it as much as we did!